Finally. The day has come. No, the bike lanes are not being removed. And no, we still have the HST. Rather, something more important has happened. We got to play a league game that ends before most restaurants close! That calls for a celebration. For awhile there, we were being punished with one crappy late-night restaurant after another. Our bodies can only take so much mediocre, greasy Chinese food. Hey, don't get me wrong, I like Chinese food; but the continual ingestion of oil was beginning to take its toll. As it is commonly known, as easy as the grease goes down, it comes out equally so. TMI... So with the game ending at 7:45pm, the world was our oyster (in terms of restaurants that is). Now with all that choice, you'd think it would be easy. Nope, that is never the case. Yet we knew one thing - no Chinese food! Whenever we think "healthier", it only means one cuisine. And we're not talking about the meatless variety either. It's Japanese. Yah I know, there are some unhealthy options in Japanese food too. Just give us this one. At least it feels like we're eating healthier... So with a wide selection of Japanese restaurants, we were able to find one that met the locational needs of most people. 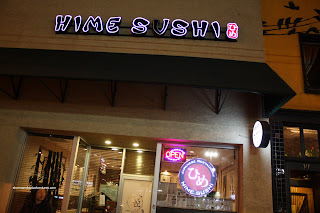 The Broadway location of Hime Sushi ended up to be our eating destination. 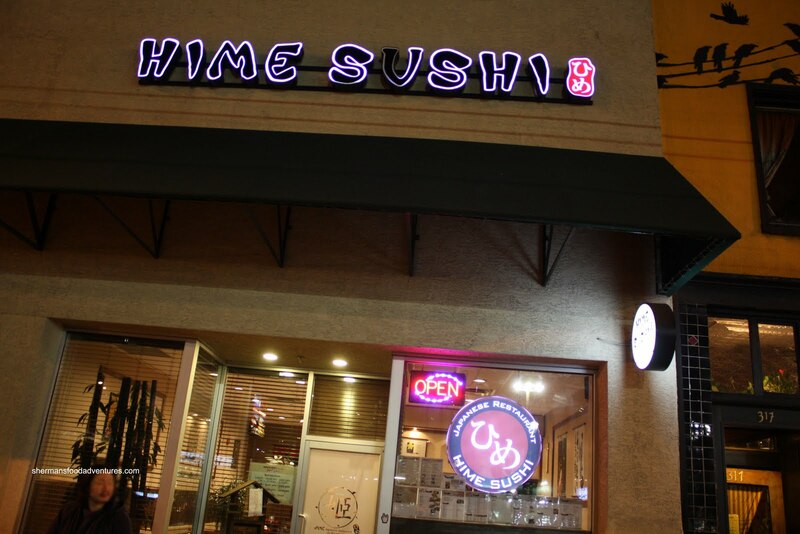 For those who care, the place is Korean-owned with a Japanese sushi chef. Sweet Tooth, who is Japanese, acted as our authenticity police for the night. Before we even got down to ordering (which Emilicious did quite nicely), a small complimentary plate of Edamame was served. Although it was essentially a small plate of beans, it was not lost upon us that this was a nice gesture. In the picture, there was a cute little container of shichimi (spicy salt typically used to season udon). The first actual dish to arrive was the Miso Tofu. 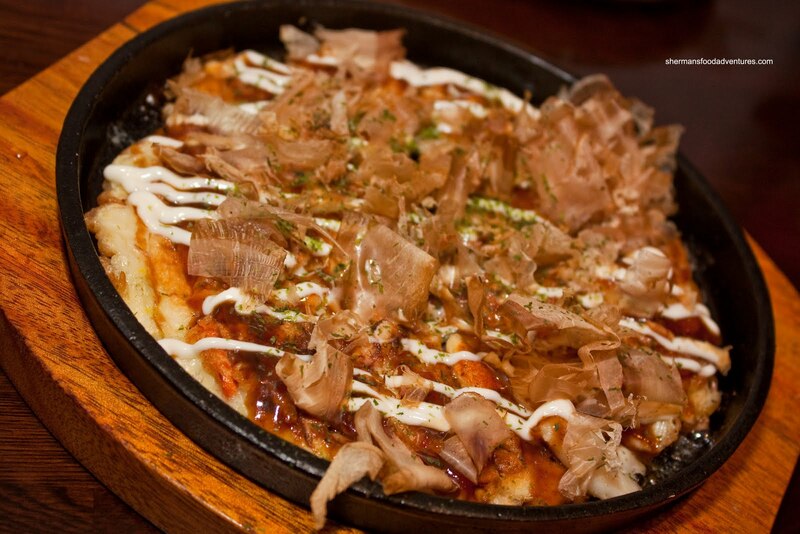 Baked and sitting on a sweet miso sauce topped with bonito flakes, this was a mild tasting dish. 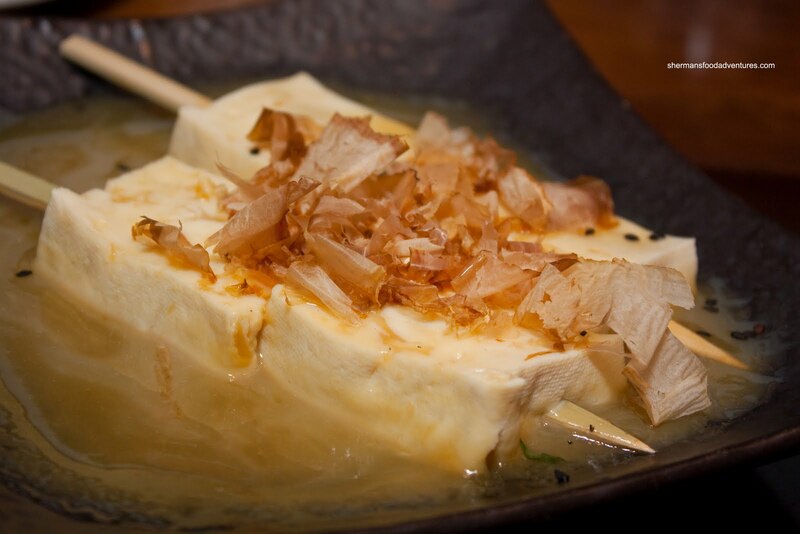 However, if you pick up the right piece of tofu with plenty of sauce, there was a wallop of flavour consisting of both sweet and savoury. I wouldn't go as far as categorizing the tofu as silky; but it was soft nonetheless. 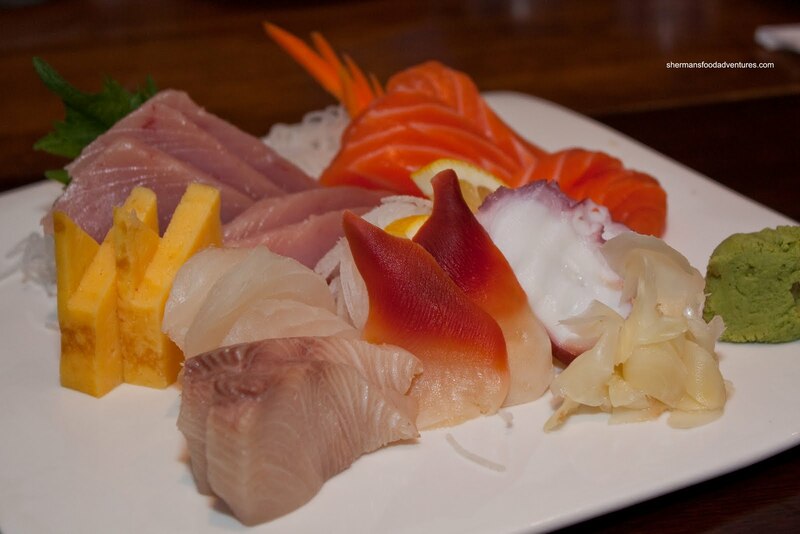 According to Sweet Tooth, there wasn't much amiss with the Deluxe Assorted Sashimi. Everything had a nice sheen while there was no complaints about the freshness. We liked the tuna and salmon since they had the desired texture being soft; yet not mushy. I thought the tako was sliced slightly too thick which in turn made it chewier than normal. Other than that, the sashimi was rock solid. As if one tofu dish was enough, we got a second. Hey, where's the meat? I take back the earlier vegetarian comment. 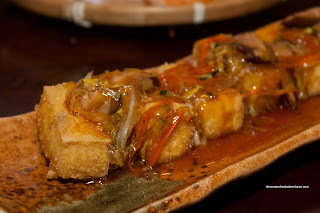 Anyways, we had the Anakake Tofu which was deep-fried and topped with a mixture of veggies and a silky sauce. We really liked this dish despite the lack of meat. Yes, we are not afraid to admit that we are meatatarians! The tofu was crisp while silky in the middle. The julienned veggies on top retained a slight crunch. Combined with the balanced sauce consisting of soy and mirin, this had some "Chinese" taste to it. Okay, we got off the healthy bandwagon with the fried tofu. 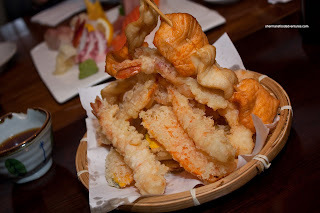 We really fell off the wagon with the Deluxe Assorted Tempura. Hey, we did get some more veggies, albeit battered and fried... We found the tempura to be made with care. The batter was light and crisp, especially with the fish skewers. Since the fish was not totally covered with batter, we could get the true texture and flavour. Unfortunately, the last few pieces of sweet potato tempura at the bottom were completely oil-logged. 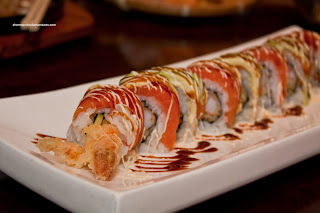 We agreed on a few specialty rolls and the first one to arrive was probably the most impactful. 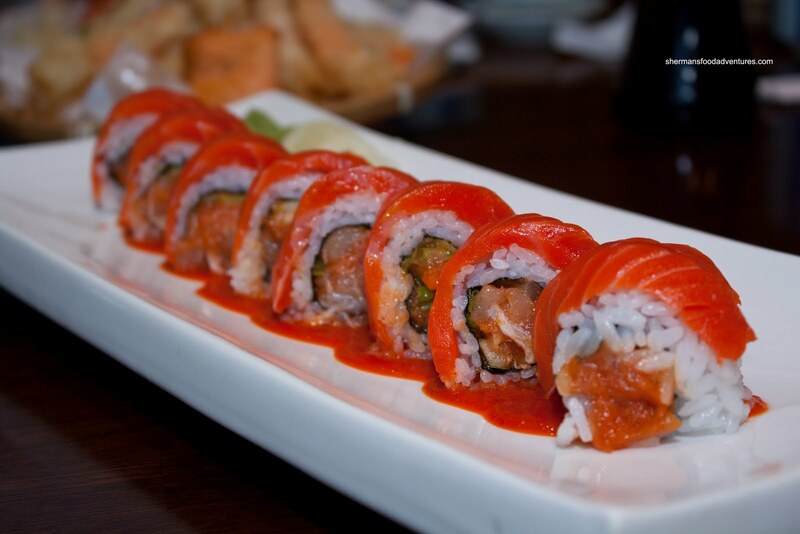 The Ocean Red consisted of spicy tuna and green onion on the inside with wild sockeye salmon on the outside. The entire roll rested on a chili hot sauce. About that hot sauce... 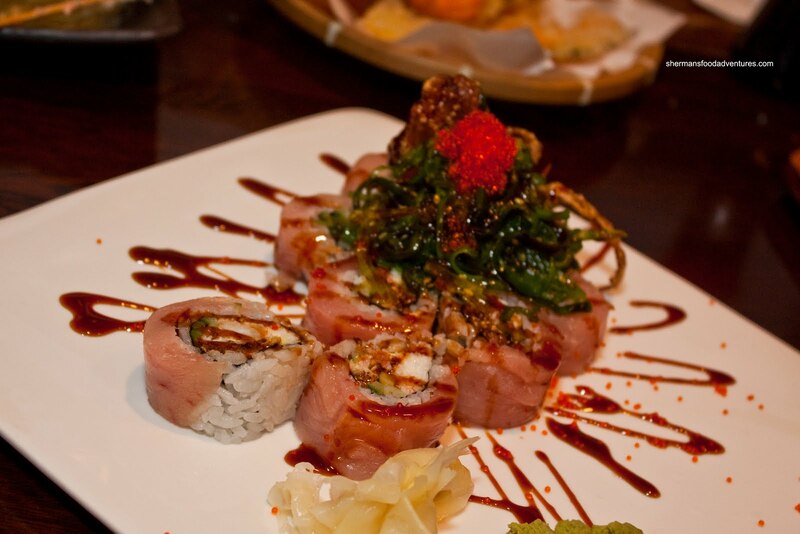 Normally, most sushi joints claim something is spicy and it ends up to be mostly sweet. Not here. The sauce was indeed spicy in a sriracha kind-of-way. Sure, it slightly overwhelmed the rest of the roll; but we liked it anyways. Our second specialty roll was somewhat of a yawner. The Red Dragon seemed to a rehash of any other fancy "Dynamite Roll" found at most Japanese restaurants. Consisting of prawn tempura, cucumber and tempura bits on the inside with salmon and avocado on the outside, there was nothing inherently wrong with the roll itself. It was just not that interesting. In fact, even with the sauce on the outside, it still was kinda bland. At the very least, the prawn tempura was still crisp. Our last roll was the Sakura Spider consisting of fried soft shell crab and avocado on the inside with tuna on the outside. The entire thing is topped with wakame salad, tobiko and house sauce. Despite the plethora of yummy ingredients, I found this roll to be only okay. The flavours were quite nice due to the wakame; but the whole thing was too soft. Even the rice wasn't able to provide much chew. The rice overall in each roll was acceptable; if not a bit better than average. Now, the Okonomiyaki didn't actually arrive last; but we I wanted to save the best for last. This was a relatively small portion; yet it probably benefited from being not too thick nor large. The pancake was full of seafood and was not doughy. It was slightly crisp on the bottom (without being oily) while there was just enough sauce, mayo and bonito flakes for flavour. The textures and flavours were well-balanced. Sweet Tooth gave her seal of approval. In fact, all of us were very content with our meal at Hime. Of course it wasn't outstanding Japanese food; however, it was better than average across the board. 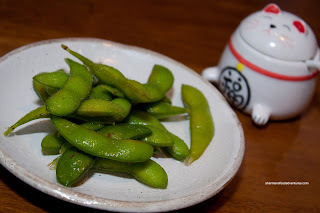 Considering the many average Japanese restaurants out there, it is actually an achievement to find a good one that is not that well-known. Nice pics...thx for the review...happy to know that u guys dont have to eat that late too...not so good for your health.